I’m always on the look-out for quick and easy meal options, ideas for those nights that the guys take over dinner prep and want some good food to appear without a great amount of fuss. Long winded recipes don’t cut it with them, but these really easy Black Bean Tostadas make for a perfect summer dinner. 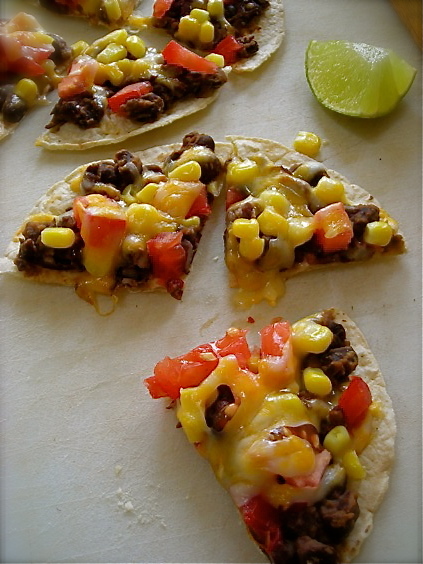 Based on this idea for a Black Bean and Corn Pizza, I took it one step more towards simple and used corn tortillas for the base, making a crispy shell that went from our toaster oven to my plate in about 10 minutes. The most time I spent was opening a can of black beans and shaking them under running water. If you’ve got a toaster oven you’ve got the means to make this in a snap but are limited to only two at a time. Using a regular oven makes for more crowd appeal. Increase the amount of all ingredients as needed for the number of people you’re serving. I would imagine that adults could easily eat two or three of these. I myself managed to shotgun four without a blink of remorse. But I was stuffed. Happy. But stuffed. Delicious as a main meal, this would also be perfect for a nice appetizer, and could easily be done on a grill with tantalizingly smoky results. The black beans make for a hearty and filling addition and no one will miss any meat in this. Fresh tomato gave it a summery flavor, and a crumble of queso fresco would be a nice addition just prior to eating them. Place drained black beans in a small saucepan and add 1/3 cup of water, the chipotle en adobo, cumin and chili powder. Stir to combine and heat until simmering. Remove pan and mash beans coarsely with a sturdy wooden spoon. Add more water if needed to make beans spreadable, but not runny. You want them to be thick. 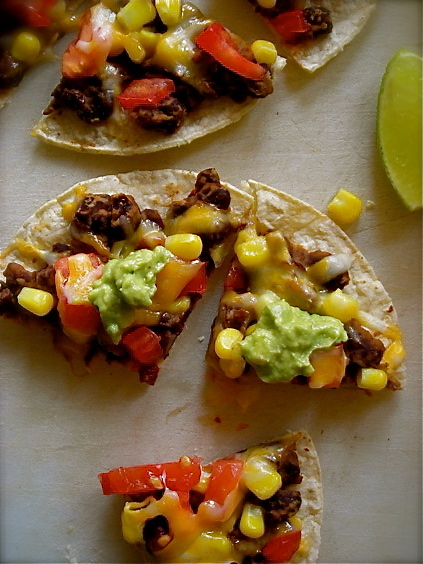 On a baking sheet, arrange corn tortillas and place in oven, turning once until tortillas are slightly firm. Remove pan from oven and carefully spread a few tablespoons of black bean mixture on them, then top with tomato, corn and diced avocado. Sprinkle a little cheese over them and return the pan to the oven. Bake until cheese is melted and tortillas are crispy around the edges, maybe 5 minutes. Squirt fresh lime juice over the tortillas before serving. NOTE: Instead of using avocado chunks on the tostadas, mash the avocado with a little lime juice, salt and pepper and use either as a topping for the tostada when it comes out of the oven, or spread a thin layer atop the black beans before adding the other toppings and baking them. Either way you use it, it’s delicious. I was just looking at tostada recipes at the recipe club to which I belong. I’ve always loved them but have never made them. The time has come for that to change. I like the idea of having this as a pantry meal later in the workweek. Looks delicious!